Or try the Free, Full-Featured Demo Version! Painless for Beginners. Powerful for Advanced Users. The Only Stock Screener Specifically Designed for Fundamental Investing. A product of ICLUBcentral, MyStockProspector has assisted long-term fundamental investors in uncovering quality stocks for over 15 years. Fundamental investing is a time-tested, long-term approach that determines the value of a stock by analyzing the "fundamental" data of a company – such as its earnings and revenue – to determine the comparative value of its stock at the current price. 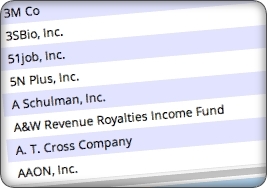 In this special presentation, ICLUBcentral President, Douglas Gerlach, demonstrates how easy it is to use MyStockProspector.com to find quality stocks that fit your criteria and investing style. Try MyStockProspector.com in action in our free, full-featured demo version! Find Quality Companies To Study in Seconds! Choose from Over 120 Individual Criteria in 7 Categories Including Growth, Value, Quality, Safety, and Projection. MyStockProspector Accesses High-Quality Data On Stocks Traded On US and Canadian Exchanges. Individual Weighting and Ranking of Criteria Through Adjustable Controls. Drag and Drop to Choose the Exact Items You Want to Include in Your Search Report. 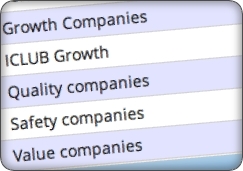 Easily Compare Promising Companies Using the Report Fields You Specify. 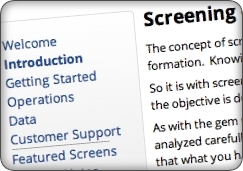 Powerful Customization Features Enable You to Define Your Report with Exacting Precision. Sort and Search Within Your Results to to Find the Best Companies That Meet Your Criteria. 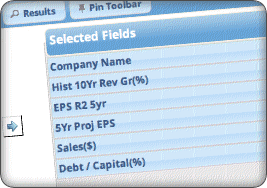 Quickly Analyze Any Stock Within MyStockProspector or Export Your Results for Further Analysis. 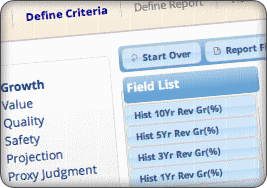 Save Your Stock Screening Criteria for Future Use or Edit Your Criteria to Refine Your Results. 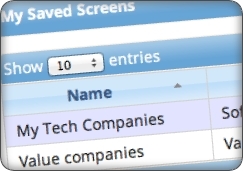 Return to Your Saved Screens at Any Time to Update Your Results and Find New Stocks Based On Your Criteria. Discover New Stocks to Study with Predefined Screens from the Experts and Pundits at ICLUBcentral. Get MyStockProspector Today and Start Uncovering Quality Stocks!